Something that should be in any off road gear box is a tow strap. With all that are out there on the market it can be tough to choose a quality one that is right for you. 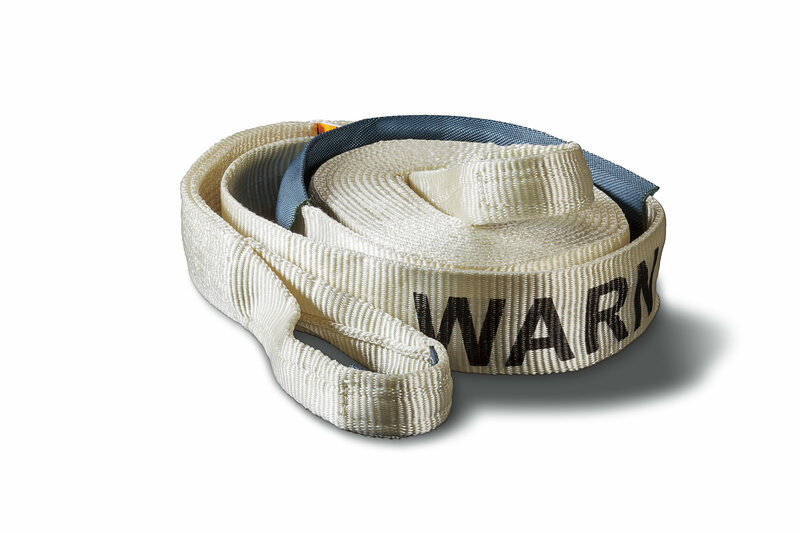 Look to one of the leaders in winches like Warn for their Premium Recovery Strap. These straps come in 3"x30' & 2"x30' sizes to help pull you or a fellow Jeeper out of many types of sticky situations. Nylon Webbing: This high quality webbing absorbs the shock when doing heavy pulls while the elastic rebound energy helps in fast recovery. Encased in the high quality webbing is a red warning marker to let you know if the strap has become damaged. A nylon sliding sleeve to prevent damage from sharp objects while reinforced end loops come with abrasion resistant wear pads. Pull Rating: The 3"x30' strap has a rating of 21,600lbs while the 2"x30' strap has a rating of 14,400lbs. to help get you or others on the trail out of a jam. Safety: Tow straps are never to be used in a winching operation.